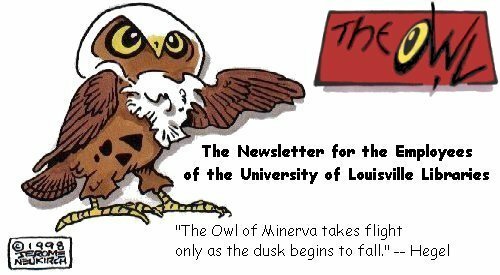 The Owl is the newsletter of the University of Louisville Libraries. Its purpose is to promote communication among the various libraries. Beginning with 2002, The Owl issues will be posted on the web as .pdf files. The Owl is usually published six times a year by the University of Louisville Libraries, Louisville, KY 40292. Deadline for publication is the 21st of each month.